Helps prevent free radicals from attacking your macula – and protect the area of your retina that helps you read fine print! Helps support clear, youthful eyesight, and improves the appearance of sharp lines and bright colors. HOW CAN Eye Health Essentials ® HELP? Eye Health Essentials® Gives You 13 Clinically Researched Nutrients At The Dose Recommended for Maximum Results – in One Easy-to-Take Formula! This comprehensive eye health program you will help you safely and easily maintain optimal eye health, support youthful vision and protect your night vision. Formulated using cutting-edge research and clinical studies in eye health, this total vision-nourishing program was specifically developed to help promote clear vision as you age. 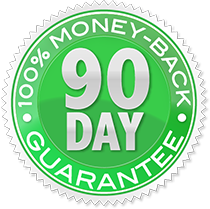 It's a 90-day program consisting of small easy-to-swallow capsules and a 30 minute progressive relaxation audio CD designed to help relax your overworked, tired eyes. Eye Health Essentials® is a potent vision-nourishing supplement that works by feeding your eyes the nutrients they need for genuine eye health and vision support. Protect every part of your eyes as you grow older. Support healthy night vision - and feel at ease at the wheel after dark! Shield your eyes from harmful UV rays – nature's “internal sunglasses” block eye-killing sunlight! Guard your macula from free radical damage – and preserve the area of your retina that helps you read fine print. Feed your eyes for healthy blood flow and optimal visual health – and keep blood vessels – even the smallest capillaries in your eyes – supple and full of elasticity. A remarkable eye-health dynamic duo! Recent studies published in the American Journal of Clinical Nutrition prove these potent sight-nourshing nutrients can help protect your eyes from harmful UV rays... guard against dangerous free radicals... and support healthy circulation in your eyes... so you can protect – and even restore – your vision! Nature's sight-saving “dynamic duo” helps your eyes rapidly adjust to darkness – and helps protect your eyes from nighttime vision problems! To keep your macula healthy – and fight off cataracts! To protect delicate eye tissue... support normal blood flow to the capillaries of your eyes... and defend against cloudy, blurry vision! For the ultimate relief from occasional dry... itchy... watery... tired... bloodshot eyes! To keep the lenses of your eyes clear. To help protect your eyes against free radical damage. Also helps support clear visual acuity. Supports retinal health, macular density and health aging of the eyes. Plus, in published studies, researchers found that ALA is especially vision friendly in patients with blood sugar concern. To ease tired, fatigued and strained eyes. Also a powerful free radical fighter! "I recently started using Eye Health Essentials. After one day my vision improved noticeably. When I went to see my eye doctor for my regular vision checkup they said my overall eye health was brilliant for a 72-year old. The biggest surprise was after my eye test it was proven my sight had markedly improved compared to my last prescription glasses. I needed around 10% less correction in the right eye and 17% less correction in the left eye." As with all dietary supplements, those who are pregnant or nursing should consult their physician. Do not take this product if you know or suspect that you are allergic to any ingredients. This product is not intended for individuals under the age of 18. Persons who suffer from medical conditions or who are taking medications should consult their physician prior to taking this product. The best time to take Eye Essentials is first thing in the morning. Eye Essentials can be taken with or without food. Not at all! It’s never too late to protect the vision you have – and even improve your eyesight. To help keep your vision as strong as possible, and help prevent future problems. Yes, Eye Essentials is Gluten Free, Soy Free, Yeast Free, and Nut Free. Yes, Eye Essentials is 100% natural and contains NO animal derivatives. Yes, You can open the capsule and mix with apple sauce or any food you like. Yes! 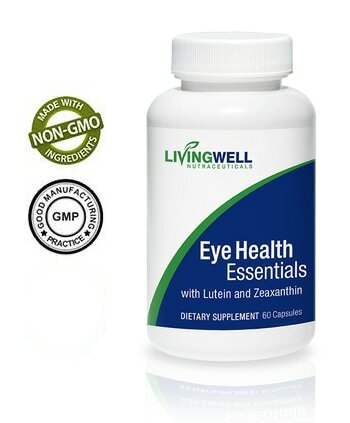 Eye Essentials is especially formulated to supplement a good multivitamin program. With every serving you get 13 clinically-backed nutrients you need to protect and restore your vision – without overdosing on the ingredients you’re already getting from your multivitamin. 1. Why are we sending you these Pinhole glasses? The Pinhole glasses are being given to you as part of the process of helping to reduce the strain in your eyes. The muscles of the eyes are under continues strain and that tension in the muscle that is connected to the eye in time changes the shape of the eye and change the focal point on the retina and that is why you vision get blurry. And to put it in simple terms, if you use these glasses, as much as you can tolerate you can minimize the strain on those muscles and help the eye ball regain a better shape thus help the eye ball focus. 2. What is the best way to use the glasses? Like with anything we suggest that you experiment with the glasses, but here are some guidelines. Duration: There is not set about of time that is required to use the glasses but we would suggest that you at lease use the glasses for several minutes at a time several times per day. Activities: There are many different situations that you can use the glasses, including, watching TV, working on the Computer, Walking, doing house hold chores, and even reading… Conditions: The glasses do work best when the area you are in is well lit. 3. What conditions do the glasses work best for? The glasses can be use by anyone that has eye strain regardless of the condition of your eye, in fact that means everyone can use the glasses. But to be specific individuals who are nearsighted, farsighted or with presbyopia, will enjoy great results. 4. Here are some simple activities you can do with your glasses on. Look at 4 fixed objects in the distance, and starting from left to right, look at each point for just a moment, (not moving your eyes but you head and eyes as one) then go around the square at least 10 times, then go in the opposite direction at least ten times. As alternatives pick an object either closer or further away and repeat. You can then pick 4 focal point further apart from each other and this time mover you eyes and keep you head still and look at each point, for just a moment, and then go in the opposite direction at least 10 times each. This action is a favorite for most who use the glasses, as you will see just how clear you really can see, take some printed material that you are not familiar with and hold it at a distance that is blurry to you, then put the glasses on at the same time move material closer and/or further away till you get super clear focus on just one word or even just one letter of the word. Then move the material closer and then further away with the glasses on and really try to relax and let your vision become clear and focused without strain. Eye Essentials is formulated for long term use, in order to support the eyes and visual acuity as you age. Add Eye Essentials to your daily supplement regimen for best results. Yes in fact, it is the most important aspect of taking any supplement. We suggest that you take Eye Essentials with 8 oz of water and then 15 minutes later, drink an additional 8oz of water. This ensures the ingredients are flushed into your small intestine for absorption. Individuals taking any medication should consult a physician prior to taking Eye Essentials. It is recommended that you wait at least 60 minutes after taking Eye Essentials before taking any medications. Yes, but only if you eat foods like liver...spinach… brussel sprouts and turnip greens every day NON-STOP. Eye Essentials™ is the fastest, and easiest way to give your eyes the nutrients they need to restore healthy vision. We can not suggest or support the use of Eye Health Essentials if the expiration date on the bottle has passed. If you choose to take the product past the expiration date you do so at your own risk. In fact, next time you’re in a vitamin store, take a look at the popular vitamin supplements. You’ll find that NONE of them contain all 13 powerful nutrients clinical studies show your eyes need to maintain sharp, clear vision as you get older. 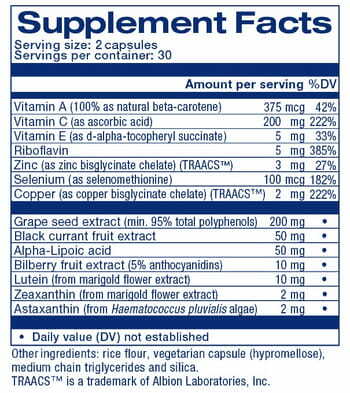 And when they do contain some of these nutrients, the dosage amounts are so tiny, it’s almost pointless to include them! That’s why you’ll only find Eye Essentials™ right here at losethebackpain.com. It’s the only way to ensure you get the maximum dosages of all 13 nutrients… at the LOWEST price available. The suggested dose for Eye Essentials is 2 capsules per day. There is no need to exceed that daily dose. Each bottle of Eye Essentials contains 60 capsules. Each bottle contains a one month supply. We guarantee you’ll love Eye Health Essentials or we’ll refund your money. If you’re not happy for any reason, simply return Eye Health Essentials within 90 days of your purchase date for a full refund, less shipping. No questions asked. Each bottle of Eye Health Essentials® contains 60 capsules, a one month supply. And the suggested dose for Eye Health Essentials® is 2 capsules per day. There is no need to exceed that daily dose. Eye Health Essentials® is formulated for long term use, in order to support the eyes and visual acuity as you age. Add Eye Health Essentials®to your daily supplement regimen for best results.